Introducing the classic Buckeye candy in cake pop form! 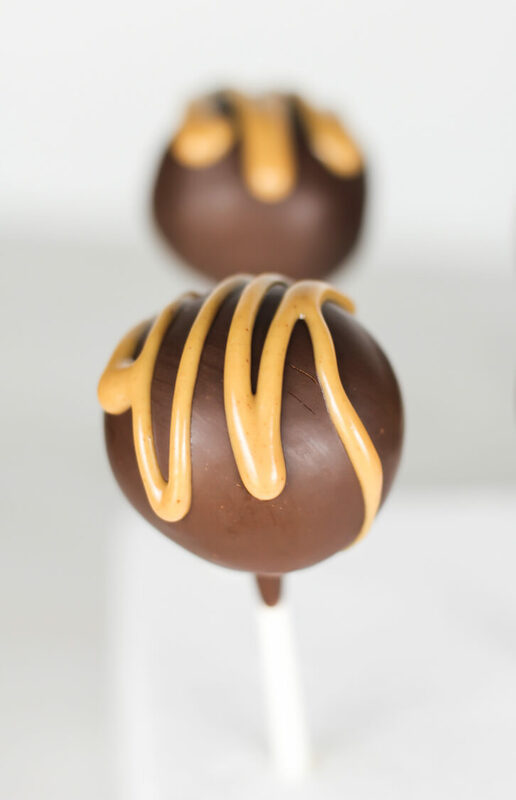 The center of these buckeye cake pops is a mixture of peanut butter cake and frosting, which is then dipped in chocolate and drizzled with more peanut butter. Have you eaten a buckeye before?? Inspired by Ohio’s state tree (the buckeye), it’s essentially a sweet peanut butter truffle dipped in chocolate. Technically, you’re supposed to leave a small circle of peanut butter exposed, so it resembles the nut of the buckeye tree. However, tradition in my family has always been to cover them completely in the chocolate. The more [chocolate] the merrier, am I right? Please note that this page contains affiliate links. I will earn a small commission if you purchase through these links, at no extra cost to you. I only recommend tools and brands I know, use, and trust. Thank you for helping to support Flour Covered Apron! I know for most people, buckeyes mean Ohio, THE Ohio State, and football. But to me, buckeyes mean Christmas! Cut out sugar cookies and gingerbread men are fine and all, but my favorite “Christmas cookie” has always been buckeyes. Growing up, my family made them each year as part of our holiday baking and it was definitely one of my favorite traditions. Together, we would huddle around a little pot of melted chocolate and take turns dunking the sugary peanut butter truffles. Then, we’d keep dozens of buckeyes in the fridge all during the holiday season and each day, we’d sneak one or two (or occasionally three!). I always get nostalgic about the holidays around this time of year. I would very gladly take a pass on the rest of the winter season, but the holidays still carry such a sense of magic for me: Christmas music, cozying up by the fire, holiday lights, exchanging gifts, and of course, prime baking season! As the weather gets even cooler and holiday season fast approaches, I can’t help but day dream about buckeyes. And this year, I was determined to turn my favorite holiday treat into a cake pop! I think cake pops are so fun, and while the process does require a few steps, they aren’t difficult to make at all. Plus, you don’t need any fancy equipment, just make sure to grab some lollipop sticks and a couple foam blocks . Fair warning, this buckeye cake pop recipe is absolutely meant to feed a crowd! Assuming you snack on some of the peanut butter cake warm out of the oven (highly recommended ;)), you should end up with about 45 cake pops, give or take. Which means, these would be so perfect for a party! And in fact, if you do happen to be an Ohio State fan, I think it’d totally be worth throwing a football-watching party just for these buckeye cake pops! If you make this recipe, don’t forget to share with me on Instagram @flourcoveredapron. Peanut butter cake pops dipped in chocolate and drizzled with melted peanut butter. Preheat the oven to 350 degrees Faherenheit and prepare a 10x15 inch jelly roll pan by lining the bottom with parchment paper. In a medium-sized bowl, whisk together the flour, baking powder, and salt. Using an electric mixer, beat together the butter and peanut butter until smooth and well incorporated. Add sugar and beat together on medium speed for a few minutes. Wth the mixer on low speed, add eggs one at a time. Beat until combined after each addition. Add the vanilla and mix together. Alternate adding 1/3 of the flour mixture and 1/2 of the milk, starting and ending with the flour. You will have three additions of flour and two additions of milk. Pour batter into the prepared baking pan and bake at 350 degrees for 27-30 minutes, or until a toothpick inserted into the center of the pan comes out clean. Remove from oven and let cool in pan for about 10 minutes. Then, turn cake out onto a wire cooling rack and let cool completely. Meanwhile, make the peanut butter frosting. Using an electric mixer, beat together the butter and peanut butter until light and fluffy. Add the salt and vanilla, mix to combine. Gradually add the powdered sugar, mixing on low until incorporated after each addition. Then, add heavy cream and beat until smooth. Once the cake is cooled completely, crumble the cake (using your hands) in a large bowl. Add peanut butter frosting about 1/4 cup at a time and mix with a spoon, or with your hands until mixture sticks together and can be formed into a ball. Don't overdo it with the frosting - you shouldn't need the entire batch. Form the cake mixture into equal sized cake balls and place on a cookie sheet lined with parchment paper. Chill for a couple hours. Melt the chocolate and pout it into a container convenient (deep, and somewhat narrow) for dipping. I like to use a mug. Remove just a few cake balls from the fridge at a time. Dip the tip of a lollipop stick into the chocolate and then insert about halfway into a cake ball. Dip cake pop into the chocolate until it's covered completely and rotate to allow excess chocolate drip off. Use a block of styrofoam* to stand up cake pops and let the chocolate set completely. Repeat with remaining cake pops. Once chocolate has set, melt 1/2 cup peanut butter in the microwave, about 20 seconds at a time, until it is a good drizzling consistency. If desired, pour into a piping bag with a small circular tip on it. Drizzle peanut butter over each cake pop. Keep cake pops chilled until ready to serve. *If you don't have a styrofoam block, you can also place these cake pops onto a parchment paper-lined baking sheet, with the stick pointing straight upward. They will be flatter on the bottom, but will look great set up on a plate. Being from Indiana, I LOVE buckeyes, an totally consider them a Christmas treat! Can’t wait for Grandma to send them every year! Thanks for this recipe, it looks divine! Yay! I knew I couldn’t be the only one. 🙂 You’re welcome!